When it comes to business travel, companies often prefer to book limo transportation for their employees. Have you ever wondered why that is the case? It may seem simpler to let employees make their own arrangements. There are actually several good reasons why employers choose to prearrange luxury business travel services. Don’t Stress Airport Parking Tampa. Catch a Ride With Us! It’s amazing how something so seemingly small as booking a travel reservation can make a major impact. Business travel would be much more of a headache without arranging transportation ahead of time. When companies send their top CEOs or other VIPs out for business travel, they want to assure that their people are safe. Chauffeurs are more than just drivers. To work as a chauffeur, one must undergo extensive training. More often than not, licensed chauffeurs are also trained, bodyguards. Groups are easier to manage than individuals. When people travel alone, they are much more likely to get lost. This is especially true when traveling in large or unfamiliar cities. By making a group travel reservation, everyone gets where they need to be on time. Uber, Lyft, and other ride-sharing services don’t always get good reliability ratings. It may seem cheaper or more convenient to grab a ride at the push of a button. However, when your ride has to stop to pick up or drop off other passengers that alter your travel time. Plus, you never know who is going to be in the car with you. There is no room for guesswork with business travel. Employers want a secure, timely ride service that they can count on. Personal car service gets straight to the point. Taxi drivers or ride service drivers often rely solely on personal knowledge or GPS directions. They may get lost when riding through unfamiliar areas or construction zones. Not to mention that one wrong turn could add major mileage to your cab fare. You should never have to pay for someone else’s mistake. When you have a tight schedule, there is no room for error. Make sure that you’re riding with a professional. Cab fare can vary depending on the driver, the time of day, or the location. Your bill is determined by the actual mileage, which can also vary depending on the route taken. These variances make budgeting very difficult. When business professionals are left in charge of their own travel expenses, it becomes a free-for-all. You have to keep up with receipts. The receipts have to be turned in to the accountant. Expenses have to be approved. The company has to cut several checks for each traveler. It takes a long time to get your money back. It’s much better for everyone to book transportation up front. Briefing on the way to the event keeps information fresh. When colleagues travel together, everyone is more likely to be on the same page. There is more opportunity for brainstorming sessions. Camaraderie is bolstered since everyone has the same experience. Continue conversations en-route to the next meeting. You don’t have to drop your thought at the door. If you find yourself in the middle of a good talking point, you can take the conversation with you. Since you don’t have to focus on driving, you can spend time catching up or debriefing from your meetings. Need to Book Car Service Near Me? Forget road rage and traffic anxiety. It’s difficult not to get angry when you’re surrounded by traffic and road noise. If you’re not behind the wheel, you can kick back, relax, and ignore the noise outside. Another perk of not having to drive is being able to enjoy all that your luxury vehicle has to offer. Grab a drink from the minibar. Enjoy a snack. You can even take a nap on the plush limo seating. Pick the perfect ride for your needs. 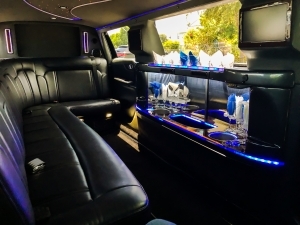 Limousine service isn’t just limited to its namesake vehicles. With the right transportation company, you will find a diverse fleet of limousine cars for any type of group or event. At Network Transportation, we offer a full range of limousine cars and large transport vehicles. Our professional chauffeurs can take you anywhere, from business travel to the best Tampa beaches. Check out our fleet to find the perfect ride for your Tampa events. Passenger capacity varies by vehicle. A Tampa party bus is great for a night on the town or office happy hour.